Chanel gift | Cosa Mi Metto??? Here is a gift that I buy for my self from Chanel's boutique.. it's a thing that I wanted for a long.. Have you got any idea about what it is??? Don't you wanna know? You'll discover it in my next outfit..
Ecco un regalo che mi sono comprata nella boutique Chanel.. E' una cosa che volevo da tanto tempo.. Avete nessuna idea di cosa sia? Lo volete sapere? Lo scoprirete nel mio prossimo outfit..
Hi Fabrizia!! Thank you for visiting my blog! I want to see now, I have curiosity. non vedo lìora di vedere il prossimo post! passa da me:post dedicato al concerto di George Michael a Firenze!! passa sul mio blog se ti va ok? oh! I really want to see it!!! I'll be waiting your new post... Kisses!! can't wait to see what's in that heavenly bag!!! Chanel happens to be one of my dreamiest fashion houses! I'm sure that whatever it is you're going to be gorgeous as always!! Can't wait to see it ! Hi pretty!!! i'm so happy you like my blog :) Of course i follow you too!!! 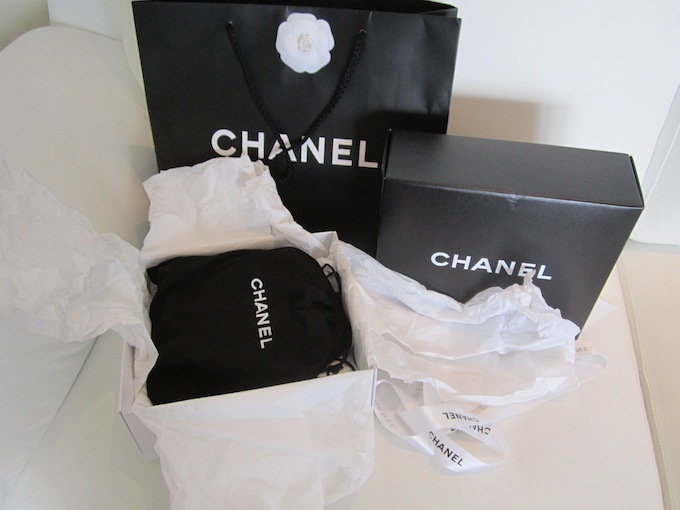 I cann't wait to discover the purchase you buy to yourself from Chanel!!! I certainly want to know what's inside that bag ! I loved your blog ! I'm following you at bloglovin, twitter and facebook. chanel <3 sarà sicuramente qualcosa di bello! complimenti per il titolo e l'impostazione che hai dato al blog! mi piace! que intrigada me has dejado????? Hi Fabrizia! I love your blog and I follow you! I love your pink converse! i´m expecting for your sorprise! love chanel! I'm so curious right now. I'll also guess it's 2.55 but who knows. Can't wait to see your next outfit. Maybe a bag? Or shoes? ?Wait for your outfit!Btw thank you so much for the comment! Hi! Thank's for visit my blog. I follow you now, hope you'll follow back. Can´t wait to know what it is!!!! Ciao Fabrizia , dalla forma della scatola non sembra la classica 2.55...Sono curiosissima :-) attendo il prossimo post!! Vim conhecer seu espaço e adorei o que vi por aqui, por isso já estou te seguindo. Vou aguardar a sua visita e ficarei feliz se me seguir também. looking forward to see your present!! Lucky girl!!! I can't wait to see - I LOVE Chanel & want a bag form there so, so bad! Hope that you have had the chance to enter our giveaway for a Tiffany & Co. necklace! Intrigued ! Show us more ! It`s Channel !! ohh my got!! what u got??!! Hmm... i'm very curious right now! Pois é, eu só fique sabendo que o designer criou, de fato não sei se a coca vai lançar ou já lanou. Mas também quero muito. Show us more! Now :D!! I want to see it too!! la scatola ha le dimensioni di una delle mie: dico collana!!! Congrats on the Chanel purchase! Can't wait to see what it is. hahha Can't wait to see it! :)u r so cute!! kisses! thanks for the comment I love your blog. whatever it is, I'm sure it's great if it is chanel! Thanks for your lovely comment on my blog, I really like yours too. Now following :) Looking forward to seeing what is in that Chanel bag! Thanks for visiting my blog dear! wow!! inredible gift because i love chanel! i want to see it! Mmmmm. Is it a wallet? hate you!!!! hahahahaha i love Chanel, everything of Chanel xoxo! I would say necklace - that pearl one? I bet it's something super lovely. Is it the 255 bag? can't wait to see it! what's that,waiting for your updates,a big surprise? ain que chic! adoro chanel! volte sempre por lá, te espero! Hey thanks for visiting my blog...I just followed you. Please follow me back. Cant wait to see. May be a belt? We have a lot of intrigue!! Can't wait to see it! I love Chanel! Hi, thanks for your comments, I like your blog and your style. I love so much Chanel!! What's this gift? I can't wait to see! I bet it is fabulous! I had a pair of shoes from my friends for my 30,,,and we're offering a pair of shoes to another friend for her 30 too,,,,it's sooo nice!!! For sur e it is the 2.55 bag¡ I dream to have one someday!its the bag of my Dreams! What is in that bag!?!!!?! Lovely blog, follow me too! ?